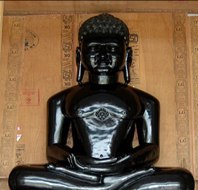 In its earlier incarnation, Lord Ajitnath's soul was the great king Vimalvahan of Susima city in Mahavideh area. He led a pious life in spite of the available princely grandeur. At an appropriate time, he became an ascetic under Arindam Suri. Meditating about the omniscient and liberated souls and indulging in harsh penance, he purified his soul to a level where he could earn the Tirthankar-nam-and-gotra-karma. Completing his age, he reincarnated as a god in the Viaya-anuttar-dimension. After completing his age in the dimension of gods, the soul of Lord Ajitnath descended into the womb of queen Vijayasena, wife of king Jitashatru of Vinita town, on Jyeshtha Krishna Paksha 30 of Hindu Calendar. Queen Vijayasena saw fourteen (sixteen according to Digambara Jain Sect) auspicious dreams. Vaijyanti, the wife of king Jitashatru’s younger brother, Sumitra, also saw the same dreams. This was a queer coincidence. When the augurs were consulted they advised that queen Vijayasen would give birth to a Tirthankara and Vaijyanti to a Chakravarti King (monarch of six continents). Queen Vijayasena gave birth to a son on the tenth day of the bright half of the month of Magh (according to Hindu Calendar). The same night Vaijyanti also gave birth to a son who was named Sagar. During the Vijayasena’s pregnancy, the influence of king Jitashatru was enhanced to such an extant that even the enemy kingdoms sought and negotiated friendly treaties with him. It became a common practice to say, "King Jitashatru is invincible (Ajit)." So when Vijayasena gave birth to the son King Jitashatra named him as Ajit, inspired by the popular lore. Time passed by and prince Ajitnath came to a marriageable age. He had, by this time, totally involved himself in religious activities. He was not intrested in marriage. But just to obey and pay respect to his mother's feeling he agreed to marry. He was married to Laxmi but, he kept himself reserved. Hardly would the couple meet. As king Jitashatru became old, he wanted to devote the last part his life to spiritual pursuit, he called his younger brother and asked him to take over the throne. Sumitra had no desire for the kingdom, he too wanted to become an ascetic. Both the princes were called and offered the kingdom. Ajit Kumar was a naturally detached person since childhood, and so he too declined. At last prince Sagar ascended the throne. Ajit Kumar became an ascetic on the tenth of bright half of the month of Magh (according to Hindu Calendar) and went into remote and dense forests for his meditation and penance. His personality and the intensity of his lofty practices cast a pacifying influence all around. Natural enemies in the animal kingdom, like lion and cow, wolf and deer, snake and mongoose used to come and sit around him peacefully. After twelve year period of deep meditation and other spiritual practices Ajit Kumar attained omniscience on the eleventh day of the bright half of the month of Paush. The gods created Samavsharan (the divine pavilion) and Bhagawan Ajitnath gave his eloquent and magnetic discourses. Thousands of people accepted the path of renunciation. When his last moments were approaching, Bhagavan Ajitnath went Sammed shikharji. With one thousand other ascetics, he commenced his final meditation. He attained Nirvana on the fifth day of the bright half of the month of Chaitra (according to Hindu Calendar).